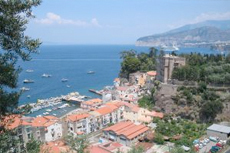 Visit the beautiful water-side town of Sorrento, home of the famous Limoncello, and enjoy! Took Sorrento and Pompei tour with Celebrity Cruises. Tour combined with Pompeii. See comments in other review. Sorrento is a delightful town and we wished we could have spent more time here. This excursion stated that walking was solely at guest&apos;s discretion and a level 1. We were bused to the city and we&apos;re on our own to explore for a short time. We were bused to the city and we&apos;re on our own to explore for a short time. The first stop was a marketing one at a local wood furniture artisan shop. The bus took a very scenic drive to Sorrento. The bus took a very scenic drive to Sorrento. Beautiful. We had lunch then took a boat to Capri. From gorgeous Capri we took a ferry back to Naples (ship). Great tour and be ready to walk!! It was very hot, but we enjoyed our day here and lunch at Da Gigino. Nice drive to Sorrento. Once there we were taken to the city center and toured an excellent wood furnishings shop and then released for free time. We enjoyed a nice lunch and then reboarded the bus and left for Pompeii. Liked our guide - very friendly an informatve - Fabio. Liked our guide - very friendly an informatve - Fabio. The bus ride to Sorrento was exciting. I guess you&apos;d say the journey was the most fun. The town or Sorrento was unremarkable. The viewpoint of the Chapel Island was great! Beautiful village, had us walk to the beach and take a picture. A stop at a lemoncello factory, and a stop to walk around the cute little town! We ditched the tour when we got to Sorrento and had a glorious time exploring the city! Sorrento was one of the prettiest parts of Italy we visited and we enjoyed the wood working shop and shopping. Enjoyed the demonstration and inlaid wood products at Januzzi. Very good guide with good knowledge.Beautiful town with lovely bars and restaurants.Nice variety of shops Great views from coach. Went to inlaid wood working studio for presentation, then given 1-hr. Went to inlaid wood working studio for presentation, then given 1-hr. to explore and shop. Expensive shore excursion and not exactly what I wanted to do, It was ok overall, disappointed with Sorrento, not as pretty as I had expected but Pompeii was better than expected, much larger than I thought. Lots of walking! We had an hour or so free time. We had an hour or so free time. Browsed the market, and had time to eat at a local restaurant. We didn&apos;t get enough time here to give it a higher rating. We didn&apos;t get enough time here to give it a higher rating. We had sixty minutes to find a restaurant, eat lunch, and return to the bus. Perhaps the stop at the cameo factory book up too much time? The farm visit was amazing though. Part of Coast tour, first stop and lunch. Part of Coast tour, first stop and lunch. Good lunch. Stopped slightly early as many shops were not quite open. Could have used better directions from the tour guide as to where to go to look for lemon related items. Booked the Sorrento and Amalfi Coast tour. Booked the Sorrento and Amalfi Coast tour. Beautiful villages and a must see if you&apos;re in the area. Naples looks like a bit of a dump though. Sorrento was lovely, a beautiful city and we enjoyed our time there.